I am co-launching SLAM School alongside current SLAM leaders Robyn Seglem and Nicole Mirra. Starting next week, we’re hosting bi-weekly online classes that offer specific strategies for teaching and participating in a fight for U.S. democracy. We’re inspired by the international activism we have been a part of and hope to help teachers leverage the specific skills and resources available within and around our classrooms. I’ll be tweeting links to the school sessions starting net week. I hope to see you there! From discerning fake news to learning how to contact your congressional representatives to strategically organizing and communicating online, the skills and expertise of English teachers are more important than ever before. 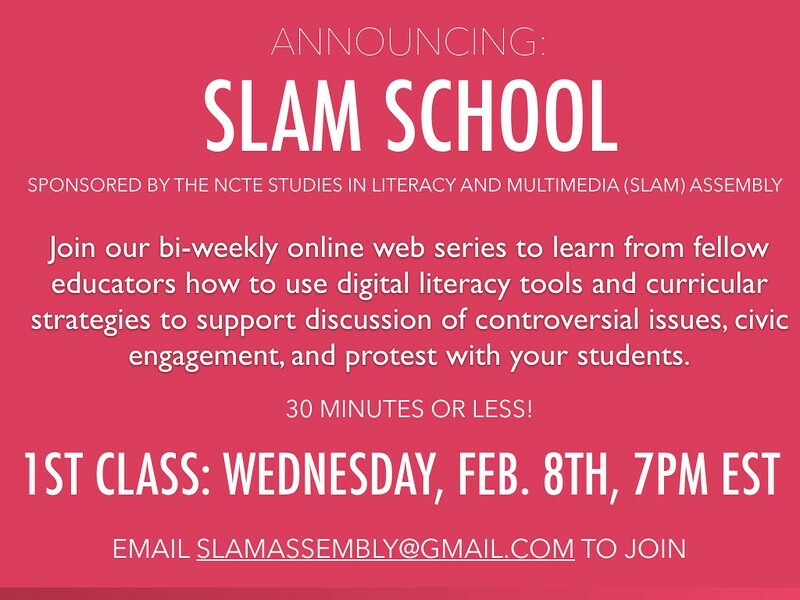 The Studies of Literacies and Multimedia (SLAM) Assembly is launching SLAM School, a bi-weekly online web series. Every two weeks, beginning on February 8th, SLAM members will offer guidance and instruction for using specific digital tools and curricular ideas to support civic engagement, protest, and discussion of the crucial issues that are shaping classroom and broader culture. These short (20-30 minute) online sessions are offered free and will be archived via an NCTE Youtube Playlist. Recognizing that the world inside and outside of our classrooms is changing rapidly, SLAM School will offer instructional tools for helping youth critique and learn about the current events around them while also giving teachers critical tools for leading the defense of public education and broader U.S. democracy. We hope you will join us. Dates will continue roughly every two weeks and will be announced at SLAM.education. Links to attend SLAM School will be posted at SLAM.education and on the Twitter Hashtag #SLAMEdu. For more information about SLAM and to suggest topics for future SLAM School sessions please visit slam.education. Posted by antero on Saturday, February 4, 2017, at 6:23 pm. Filed under education, literacy. Follow any responses to this post with its comments RSS feed. You can post a comment or trackback from your blog.